PETALING JAYA: MIC (The Malaysian Indian Congress) president Datuk Seri G Palanivel has agreed to a moratorium to allow for discussions with Datuk Seri Najib Tun Razak to resolve the party crisis. "We will have a moratorium. I do not want the party crisis to escalate," Palanivel said. The Malaysian Indian Congress (MIC), the largest ethnic Indian party in the country, has decided on a moratorium to allow it resolve the internal party crisis over elections for its central working committee, a media report said Thursday. "I and my deputy Datuk Seri Dr S. Subramaniam will stand down. We will have a moratorium. I do not want the party crisis to escalate... 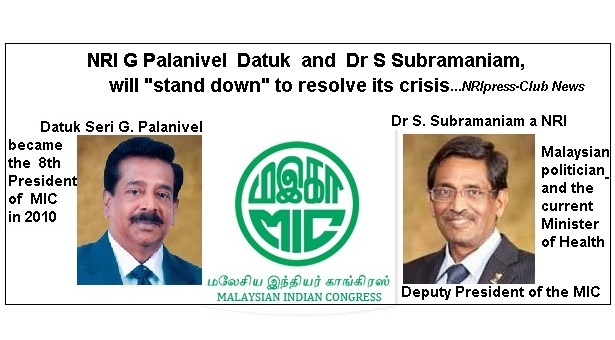 This will give us a period of non-crisis to resolve the issues that have come up," the Malaysin Star quoted MIC president G. Palanivel as saying in a statement Thursday. The MIC is a coalition partner in Malaysia's ruling Barisan Nasional (BN) led by Prime Minister Najib Razak. "We will meet and decide on the next course of action that will satisfy all quarters as soon as possible," Palanivel added. The MIC has been facing the danger of disintegration after the Registrar of Societies in December last year ordered it to re-elect its 23 CWC members and three vice-presidents. It directed the party to hold the internal elections within 90 days. But Palanivel made new appointments without prior consultation with the existing committee members and his deputy, who called the move arbitrary. The statutory body also held the appointments null and void. The MIC president said the proposal for moratorium would allow the party members to hold discussion with the prime minister. Datuk Seri G. Palanivel became the 8 th President of the Malaysian Indian Congress on 6 December 2010. He rose through rank and file in MIC after he had a long and eventful membership since 1968 while in Penang, his hometown. He took over the helm of leadership from Dato Seri S Samy Vellu in a smooth transition of power. He is the one of the two full Ministers representing the Malaysian Indian community. He served as Human Resource Minister from 18 March 2008 until 5 May 2013.